Q: In the division of work mentioned in previous paragraphs, the stacking method was ES (end-start). 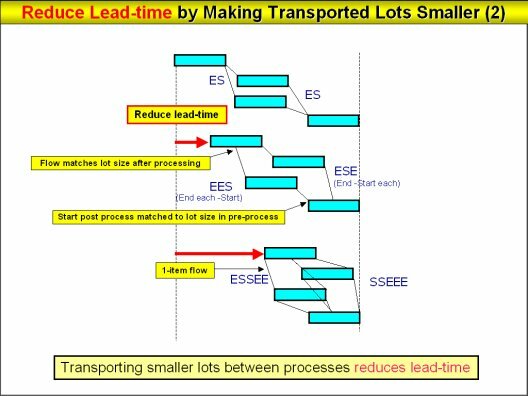 How do you cut lead-time when you divided transport into smaller lots during division of work? A: The diagram below is for explaining the EES (end each start) and ESE (end-start-each) stacking methods. In EES, transport is made according to the lot size of the earlier process and the later process. With ESE the later process starts working in line with the lot size of the earlier processes. The case shown here reduces lead-time 10-20 percent. Then what happens when you starting using one-item flow production (SSEE)? When the stacking methods ESSEE (each SSEE) and SSEEE (SSEE each) are assigned, that reduced lead-time about 50 percent as shown in the diagram.